The commodity channel index (CCI) is an oscillator used to identify cyclical trends in a security. It gained its name because it was originally used to analyze commodities. While the CCI will oscillate above and below the zero line, it is more of a momentum indicator, because there is no upward or downward limit on its value. The default period for the CCI indicator is 14 periods, just as the slow stochastics and RSI. Remember, if you choose to use a shorter setting, the number of signals and sensitivity of the indicator will increase. Traders have now begun to not only use the CCI to trade commodities but also for stocks as well. A rule of thumb for the commodity channel index is that oversold is - 100 and overbought +100. While traders will look for divergences in the CCI and the price trend, trend line breaks of the CCI is also very popular. The real story about the CCI is not the indicator, but the community that has been developed around the indicator. An independent trader Ken Wood, has created the "CCI University" that teaches detailed methods on how to trade profitably with the CCI. Since you now know the basics of the commodity channel index, I want to explore how to use this powerful indicator when day trading. First of all, you should remember that the CCI indicator is not a good standalone tool. Like any other oscillator, the CCI needs to be combined with an additional trading tool. In this article, we will combine the CCI indicator with the stochastic RSI. The first strategy we will cover is a scalping method that will allow you to hit and run for small profits on a 5-minute chart. The upper indicator is the commodity channel index and the lower indicator is the stochastic RSI. To open a trade based on the CCI + SRSI trading strategy, you will need to receive two matching signals from both indicators. These could be overbought/oversold signals, divergences, or trend breakouts. Whenever you get a signal in the same direction from each of the indicators you should follow the direction of the respective signal (short or long). The stop loss rules of our scalp commodity channel index strategy are pretty straightforward. You can simply use price action techniques to determine the proper location of your stop. For example, if you are buying, you should look for a bottom located near your entry point. Simply place your stop loss below this point. On the other hand, if you are shorting the stock, you should look for a top near your entry price. You will then use this high for your protective stop loss. The rules for taking profits with this strategy are even simpler than the stop loss rules. You should close your trades whenever the CCI or the SRSI gives you a signal in the opposite direction. It may be an ordinary overbought/oversold signal, or it can also be a divergence or a trend breakout on one of the indicators. The first two green circles on the image above show the two matching signals from the CCI and the SRSI. After the CCI line goes in the overbought area, it then breaks downwards creating the first signal. At the same time, the lines of the stochastic RSI are also in the overbought area. The second signal comes when the two SRSI lines cross downwards as well. This is a short signal and we sell the security. We then place our stop loss order right above the most recent top. This is highlighted with the red line on the image. The take profit signal comes when one of the indicators give us an opposite signal. This happens when the CCI line enters the oversold area, which is shown by the rightmost green circle. Now we will apply all the rules we discussed above into a complete trading strategy. We will add the CCI and the stochastic RSI on our chart as described in the strategy. Above is the 5-minute chart of Twitter from June 6, 2016. The chart depicts five trades based on signals from the CCI and SRSI. The green circles on the two indicators show when each was aligned and we opened a trade. The red horizontal lines on the chart show where we placed our stop loss orders for each trade. On the first trade, the price reverses creating a relatively big bearish candle. 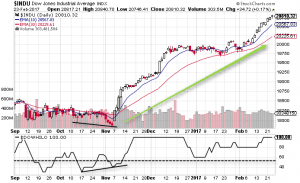 In this exact moment, the lines of the stochastic RSI perform a bearish crossover and exit the overbought area. The CCI also exits the overbought area. Therefore, we have matching signals with the two indicators and we short Twitter. Our stop loss is located above the upper candlewick which creates the previous top. Observe that the price starts decreasing. The CCI even creates a bearish trend line (blue). Suddenly, the CCI has a slight interruption of the -100.000 area creating an exit signal. At the same time, the SRSI also has a bullish crossover in the oversold area. We need only one signal to exit the trade. However, we get two exit signals at the same time, which simply means “Get out!”, therefore we exit the trade. But now we have two bullish signals from the CCI and the SRSI, right? Furthermore, the CCI breaks its blue bearish trend upwards, putting an extra emphasis on the bullish idea. Therefore, we buy Twitter and place a stop loss order below the bottom as shown in the image. The price starts increasing afterward and breaks its previous top. The two indicators are increasing too and they both enter the overbought area. However, the bearish signal comes from the SRSI, which lines cross downwards. Then the two indicators exit the overbought area, creating a new short signal on the chart. Therefore, we sell Twitter and place a stop loss order above the top. The price starts a bearish run afterward and the two indicators begin dropping. On the way down, the CCI creates a bearish trend line. See that the price breaks the trend in the second green circle on the line. This is the exit signal from our trade and we close the deal. Now we have the breakout through the CCI trend as a first bullish signal. Therefore, we are waiting for a signal from the SRSI. It comes when the SRSI enters the oversold area and its lines cross upwards. Meanwhile, the CCI line returns to its already broken bearish trend, it tests it as a support and bounces upwards. This gives additional strength to the bullish CCI signal. Now we go long Twitter and we place a stop loss below the small bearish hammer candle on the chart. The price starts increasing afterward. Although the indicators turn out to be pretty chaotic during this trade, they manage to inch higher. The CCI then breaks the 100.000 level upwards, creating our exit signal. 30 minutes later, the CCI exits the overbought area creating a short signal. At the same time, the stochastic RSI’s lines cross downwards and also exit the overbought area. This is the second short signal on the chart. Therefore, we sell Twitter and we place a stop above the top as shown with the last red line on the image. The price then decreases rapidly and the two indicators follow the same example. Here we get the exit signal only 20 minutes after we enter the trade. The CCI indicator breaks the -100.000 level and enters the oversold area and we close the trade. The five scalp trades with Twitter generated a profit of about 2% of the invested capital. At the same time, the longest trade took 1 hour and the shortest one took 20 minutes. This is why this trading strategy falls in the category of scalping. For some of you, 20 minutes is far from scalping, but the key point is the small gains and not necessarily the length of time in each trade. Let’s now go through another trading example of the SRSI and the CCI indicator settings. We now have the 2-minute chart of AT&T from June 27, 2016. The image illustrates three trading examples based on the CCI indicator trading strategy in combination with the stochastic RSI. The first trade appears when the CCI line breaks the overbought area downwards. At the same time, the lines of the stochastic RSI cross downwards in the overbought area. This gives us the second signal we need in order to short AT&T. Therefore, we sell the stock and we place a stop loss above the top created after the decrease as shown on the image. As you see, the price decreases afterward. We stay in the trade until the CCI indicator enters the oversold area. This is an exit signal according to our trading strategy and we need to close the short trade. 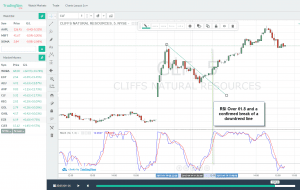 The second trade comes when the lines of the SRSI indicator cross upwards in the oversold area and one period later the CCI line breaks out of the oversold area. We have matching signals from the two indicators, which gives us a reason to buy AT&T. Therefore, we go long and we place a stop loss order below the bottom created as shown in the image. This is an interesting trade because both indicators give controversial signals. As you see, after we enter the long trade, the stock starts increasing. The jump lasts four periods and then the price begins to drop, as well as the two indicators. They even go back in the oversold area; however, we keep our trade open. After all, in order to close the trade, we need to see one of the indicators going into the overbought area, or to see the price hitting our stop loss order. Although the price decreases, it doesn’t reach the level of our stop. The price then resumes its bullish move. The increase breaks the previous stop created and at the same time the indicators increase. We close the trade with a profit when the CCI line goes into the overbought area. 5 periods after we close the second trade, the CCI line breaks the overbought area downwards. At the exact same moment, the stochastic RSI lines cross downwards. This means we get necessary signals to short AT&T. After we sell AT&T, the price instantly starts decreasing. Less than 20 minutes later the stochastic RSI goes into the oversold area and its lines cross upwards. This gives us an exit signal for our trade and we close the position. In these three trades, we generated a profit equal to about 1.00% with our CCI scalp trading strategy. The first and third trade took about 20 minutes each. The second trade took about 40 minutes. The commodity channel index is an oscillator used to identify cyclical trends. The CCI indicator consists of a line which fluctuates above and below a zero line. The indicator creates overbought/oversold signals. However, it is also used to draw trend lines and to discover divergence. The commodity channel indicator is not a good standalone tool. A good instrument to combine the CCI with is the stochastic RSI. 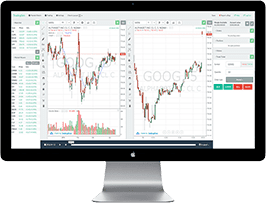 Enter trades when you discover matching signals from the two indicators. Place a stop loss below/above the tops/bottoms as a result of the change in price direction. Stay in the trade until one of the indicators gives you an opposite signal.